Newly minted religious group, Tehreek-e-Labaik Pakistan, has made it to power, winning its first-ever seats in the general elections July 25. The other, more major religious parties, suffered a stunning setback in Karachi. The Khadim Rizvi-led TLP won Sindh Assembly seats PS-107 (Lyari) and PS-115 (Baldia Town) in Karachi. On PS-107, TLP candidate Muhammad Younus received 26,248 votes against PTI runner-up Muhammad Asghar Khan, who won 15,915 votes in Lyari. Voters in Lyari, a PPP heartland for decades, opted for PTI’s Abdul Shakoor over PPP chairperson Bilawal Bhutto Zardari, in a major and unexpected blow to the PPP in Sindh. Lyari is represented by only one National Assembly seat, NA-246. The TLP won the second Sindh Assembly seat of PS-115, a multi-ethno-linguistic constituency, with Punjabis, Pushtun, Sindhis, Kashmiris and Baloch. The seat also has a good number of Mohajirs. The TLP also made its presence felt in other constituencies. In PS-109 TLP runner-up candidate, Bilal Qadri, won 19,913 votes, in a close contest with PTI rival, Ramzan Ghanchi, who received more at 25,345. In PS-96, the TLP candidate managed to receive 18,962 votes, but lost the seat to the MQM candidate, who got 19,863, in a close competition. 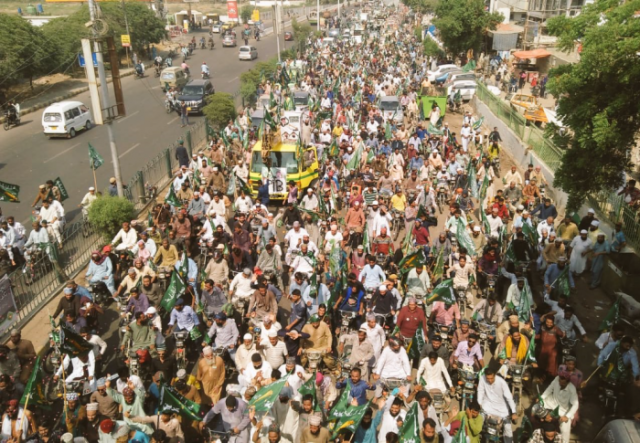 Throughout its campaign in Karachi, the TLP had mobilized voters in certain pockets and focused on the Khatm-e-Nabuwat or finality of the Prophet (PBUH). The TLP had brought Islamabad to a standstill in November 2017 over the religion controversy. It fielded more than 150 candidates across Pakistan, more than those lined up by the Muttahida Majlis-e-Amal, the country’s largest religious party alliance.